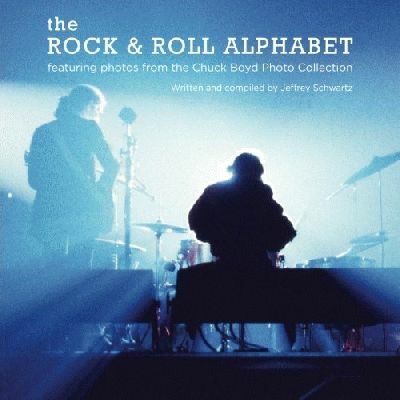 For pint-size rockers and music fans of all ages, The Rock and Roll Alphabet, by music historian and teacher Jeffrey Schwartz, is a unique and entertaining teaching tool that allows children to develop alphabet skills while learning about rock and roll legends of the 1960’s and 1970’s. Blending melodic rhymes with rare images of rock’s most influential figures, this unique children’s art and photography book reinforces alphabet skills to young children and also serves as an introduction to rock and roll history for older children. Jeffery Schwartz is the Director of the Chuck Boyd Photo Collection, a recently rediscovered archive of 30,000 photographs of rock and roll legends from the 1960’s and 1970’s. Boyd’s unique access to rock’s greatest stars yielded thousands of incredible images of The Beatles, Bob Dylan, The Grateful Dead, James Brown, Jimi Hendrix, KISS, Led Zeppelin, The Rolling Stones, The Who and others. “Chuck's vantage point was pretty remarkable," adds Schwartz. "There's a lot of rock 'n' roll photographers, but few who have had his access. When Chuck was with the band, he truly was. You see that in his work, and especially so in the photographs that have been chosen for this book. "Boyd passed away in 1991, leaving behind a collection of largely unpublished, never-before-seen photographs. Over 30 of these largely unpublished images are being presented to the public for the first time in The Rock and Roll Alphabet, ensuring the appeal of this title for many generations to come.